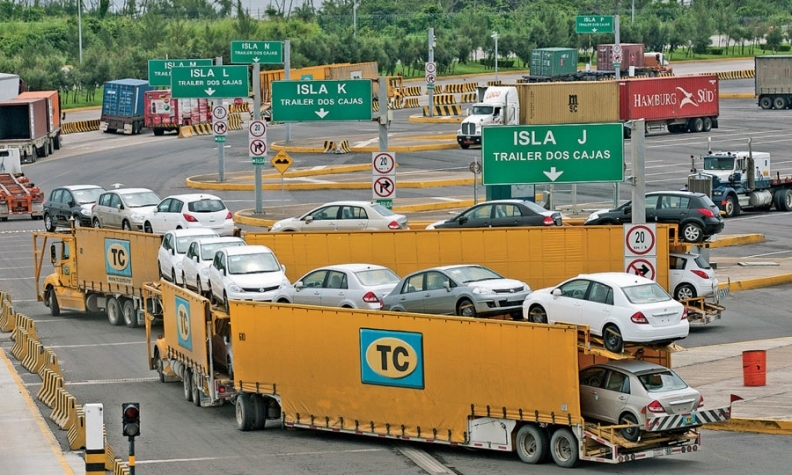 Trucks haul new Volkswagen cars at the Port of Veracruz in Mexico. The port's capacity is expected to triple by 2024. MEXICO CITY (Bloomberg) -- Carmakers from Nissan Motor Co. to Mazda Motor Corp. are churning out record numbers of vehicles in Mexico destined for consumers abroad. But some executives are worried that the factory hum will slow in coming years as exports get bogged down by congestion at the nation’s ports. The government has targeted 70 billion pesos ($4.6 billion) for port infrastructure through 2018, including building four new terminals in Veracruz. Some automakers are skeptical that the goal will be met or will be enough to handle the more than 5 million vehicles Mexico expects to produce annually by 2020 -- a 56 percent increase from the country’s 2014 output. In the past two-and-a-half years, car manufacturers including Toyota Motor Corp. and Daimler AG have invested or promised $22.6 billion for auto and parts plants, according to the government. That success story, which made the sector the largest source of foreign cash in the country, may be imperiled if the government doesn’t speed up plans for infrastructure improvements. For Nissan, bottlenecks on the docks could delay a quarter of its planned maritime shipments to the U.S., Europe and the Middle East in five years, said Horacio Saldivar, the company’s local purchasing head. In 2014, Mexico became the world’s biggest exporter of Nissan vehicles, according to the automaker’s website. President Enrique Pena Nieto has made investing in the country’s infrastructure a priority. His administration is boosting operating capacity at ports by 50 percent through 2018 and doesn’t foresee any bottlenecks at docks as new plants come online, Guillermo Ruiz de Teresa, the Communications and Transportation Ministry’s ports coordinator, said in a telephone interview. While the Veracruz port’s operating capacity has stagnated in the past three years, it will more than triple by 2024, Ruiz said. Mazda, Nissan and Honda Motor Co. are experiencing massive jumps in the number of vehicles exported from Mexico. Nissan shipped a record 538,972 cars last year, 20 percent more than in 2013, according to the company and data from the trade association AMIA. Mazda, which opened a $770 million factory in early 2014 that’s slated to become the biggest overseas facility for the Japanese producer, exported 16,017 vehicles in April, triple the amount a year earlier. Honda sent 14,880 cars and light trucks out of the country last month, more than double the number a year earlier. “The issue is only going to be heightened as more and more investment goes into Mexico over the next five years,” said Bill Rinna, a senior manager of North American forecasts for LMC Automotive near Detroit. Toyota in April announced it would invest about $1 billion in its first car factory in Mexico, with the capacity to assemble about 200,000 Corolla compact cars a year. Mazda increased its reliance on the Gulf port of Veracruz after facing “capacity issues” on Mexico’s railways, according to Keishi Egawa, CEO of the automaker's local unit. He hopes the country will expand its railways in addition to boosting port infrastructure. “At this moment it’s OK, but we are concerned about the capacity of the Port of Veracruz in coming years,” Egawa said in an interview.